Last night we got to see a totally badass (and perhaps more than a little foolhardy) Stormtrooper go toe-to-toe with Finn in The Force Awakens’ latest TV spot. Suitably impressed by his slick baton moves? You’ll soon be able to own one as part of Bandai’s fantastic Star Wars figuarts range. It’s not the first time we’ve seen this stick-and-shield variant in the toys—the Black Series line came out with a two-pack featuring this “Riot Control” Stormtrooper and an alternate Poe Dameron. But in true Figuarts style, the dynamism of this ridiculously articulated figure just makes it scream coolness. The roughly 6” tall trooper doesn’t come with a blaster like the other Figuarts trooper—just the stun baton (that also appears to be lightsaber-resistant) and plain shield (which you’d hope is also lightsaber resistant, otherwise it might be a touch useless). 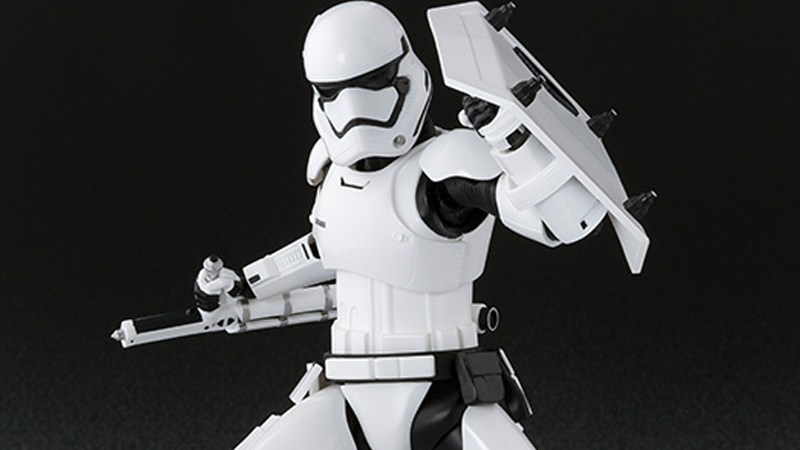 The baton has sliding parts to replicate the action of it extending and electrifying whenever the First Order Stormtrooper goes into battle, but aside from that, this is just an extremely nifty-looking, and highly poseable, little figure. The Figuarts Riot Control trooper will be available to preorder from Bandai’s Japanese webstore tomorrow, November 20th, and will set you back 5,616 Yen (around $45 USD). He just needs a Finn figuarts to square off with!